Students listen on to a Novelis employee at CiTi's Manufacturing Day. Sandy Creek Robotics brought working examples to CiTi’s Manufacturing Day. Students listen on to a Novelis employee at CiTi’s Manufacturing Day. Huhtamaki employees show students an example of what a day in the workforce would be like. 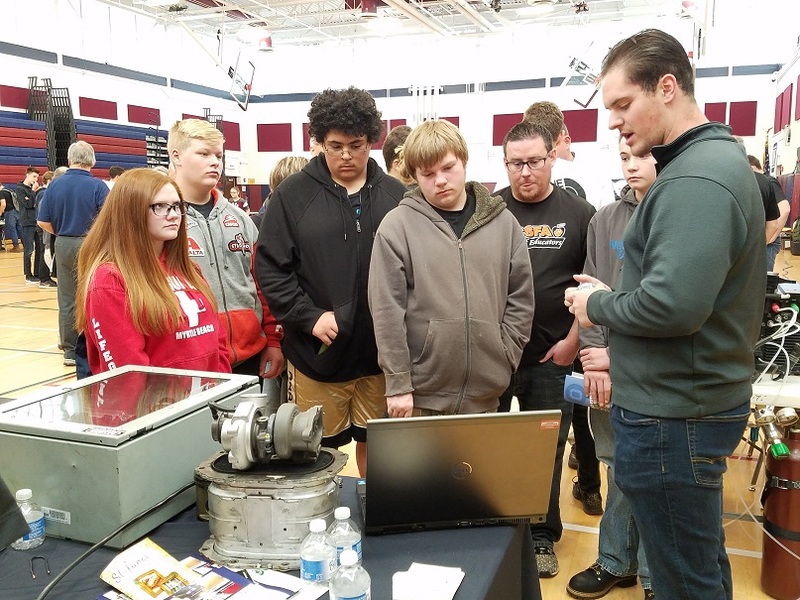 MEXICO, NY – Oswego County P-Tech and CiTi’s Career and Technical Education brought together students and local manufacturers for “Manufacturing Day” at the Center for Instruction, Technology, and Innovation (CiTi) in Mexico. On this day, junior high and high school students from all nine districts throughout the county were invited to a Manufacturing Day event at CiTi Boces to interact with local industries. The event intends to show students alternative pathways for post-graduation outside of traditional four-year college and helps to spur interest in the county’s P-Tech program. P-Tech is a program in which approved students enter as freshmen and work simultaneously toward receiving a Regents High School Diploma as well as an associates degree in Applied Science from Onondaga Community College. Completion of the program in its entirety takes five-six years and partnership with local manufacturers Huhtamaki, Novelis, The Fulton Companies, Sunoco, and Davis-Standard provide mentoring for soft skills and workforce experience as well as possible career opportunities. P-Tech Workforce and Partner Liaison Bill Lynch said the success of the program lies within “the power of the partners” as educational and industry partners come together for the success of students. P-Tech officials and local manufacturers are confident that a career path in industry can prove to be both successful and challenging. “Manufacturing is alive and well across Oswego County and across our nation really. There’s a lot of good opportunities out there. It’s a fact that there are more job openings than people available to fill those jobs, locally as well as nationally,” said Huhtamaki Engineering and Maintenance Manager Greg Hilton. More recently, manufacturing has changed to incorporate a technological base, he added. Lynch said the P-Tech program will provide students with the necessary job skills to hold the positions necessary for manufacturers. “Manufacturing is a clean industry and its well paying. There’s no college debts for our kids when they get out. A kid in the P-Tech program will graduate at age 19 or 20 with an Associate’s Degree, no college debt, and go into the workforce making a living wage,” Lynch said. 127 students from all nine districts throughout the county are currently participating in the P-Tech program. 50 students from across the county are selected through an application process each year with the first cohort of students currently in their junior year. Olivia Pappa, a Sandy Creek sophomore chose P-Tech because she thought the opportunity was a good idea. With the recruitment process almost underway, those interested in participating in the P-Tech program can browse through the program’s website and continue looking for the opening date of student applications.